Session Periods are modified. Not as per common knowledge. Asian-European Overlap Session is the Signal Period. Trading Reversals and Breakouts in Asian-European Overlap Session. Charts and Commentaries on Completed Trades. Give friendly supports and constructive ideas. Give own analyses, but NO Pictures or Screenshots please! Expose Rulebook as a whole here. It is partially shown in charts and commentaries. Expose P/L here. I’m here mainly to journal, not showing off. Reply to EVERY comment, only relevant ones. May the Boring-est Trader be the most Successful One! Could we make 1st Post be Updateable CONTINUOUSLY please? When I see a Pullback on Candle 12:00 which closed my trade at TS, I was first relieved, assuming the TS saved me from possible reversal to the Upside. But when Candle 16:00 showed strong Bearish movement. I can’t help but feeling regret of missing out. TS was hit on Candle 12:00, but not SL. Price returned to hit TP on Candle 19:00. 1. This pattern occurred several times in previous trades. Therefore, I have revised TS Policy to accommodate this type of Price Action. 2. The Pattern also confirms to me that if Candles reaching TP that also showing strong tendency to go further Up/Down, I would have to let it run until end of day. Therefore, I have revised TP and TS Policies to accommodate this type of Price Action. A little upset. I have anticipated reversal pattern at around Fractal. But this one was new to me. Candle 12:00 closed by $0.01 margin below a Fractal Level at $1322.84. In such condition, the Rulebook instructs to leave it be for now. I was also hoping too that it was just a fake reversal pattern. If only it closed above the Fractal, I was to close the trade promptly. It turned out it was a real reversal pattern to the Upside. TP almost got hit on Candle 12:00. 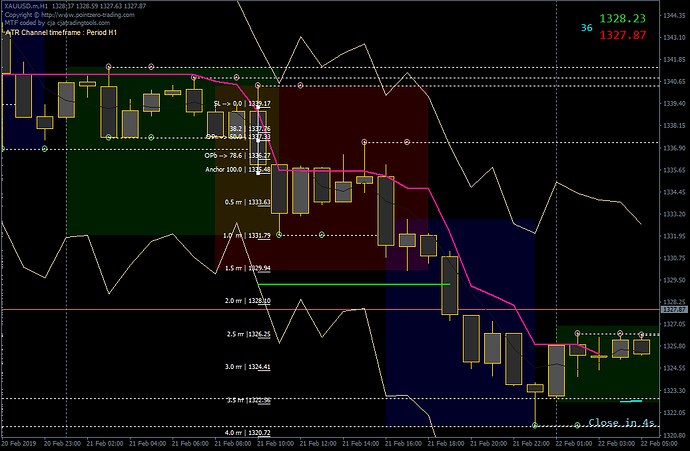 TS was hit first instead on Candle 13:00, and SL was hit on Candle 15:00. 1. Need to give ‘room for error’ on this matter. Therefore, I have revised TP Policy on the same. Wibie, may I suggest to change your candlestick colors to start with. They are almost unreadable on a black background. The background aren’t black actually. If you look carefully, I put dark-toned background of green, red, and blue on the back of the candles to indicate the three sessions. They’re colorful enough for me that adding more bright colors to the candles would be distractions. Hence I set up the grey-toned colors. A bungee-jumping trading day. The reversal happened on Candle 08:00, but Candle 07:00 didn’t formed a Bullish Candle as it typically would in a reversal sell Setup; the Rulebook didn’t say it has to form that way. I decided to take the Trade. As anticipated, after Candle 10:00 closed in the 0.5 – 1.0 rrr level range, a Pullback happened on Candle 11:00. But then by Candle 13:00 the Lower Chandelier has disappeared, and on Candle 14:00 the Upper Chandelier showed up. As per Rulebook, I closed the Trade with tiny profit. After this, all Hell seemed to break loose. First, Candle 15:00 moved fast licking on my estimated TP at $1325.82, before closing on a pullback position, and followed through by another Bullish Candle that licked my SL. Then, Price went strong to the south again, licking the TP again. 1. 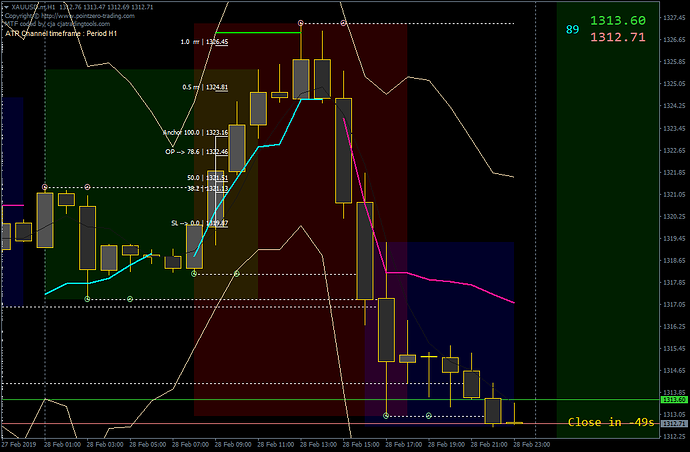 Was the Bearish 07:00 Candle a leading indication for the bungee jumping? Not sure. Need more data confirm that. 2. If such formation happened again, I would just Wait & See, and then learn. No need to risk money by joining the Trade. 3. As a precaution, I’ve revised the Rulebook to include the opposite prior-Candle as a screening. Should this be invalidated in the future, I would revise it back to the original. Feeing saved by the Rulebook. Bearish Breakout happened on Candle 09:00. But the Breakout Candle and its two proceeding Candles showed an escalating pattern. They indicated potentially exhaustive push was coming; not a favourable setup to trade with. The Rulebook already stated to stay away from it; so, I didn’t take the Trade. After that exhaustive-breakout push got realized, it pulled back and gradually move against the Trade’s direction until end of day, as anticipated. After OP, Price never went beyond 0.5 rrr level. It went to almost touching SL on Candle 12:00 (spread considered). Before finally did so on Candle 15:00. 1. This day’s price action reaffirmed the Rulebook’s warning. 2. Looking at recent days’ price actions till this day, longer-term tendency is Price will go up again. We’ll see. All good but… The OP-SL Range as per Rule book is too tight, i.e. $1.12. Either it indicates strong volatility is coming or practically no volatility is coming. Either way, from Risk Management POV, it’s not safe to trade such tight range. As per Rulebook, I stayed away from this trade. Price pulled back after OP on Candle 08:00 and touching what supposed to be my SL at $1327.84 immediately on Candle 09:00 (spread considered). 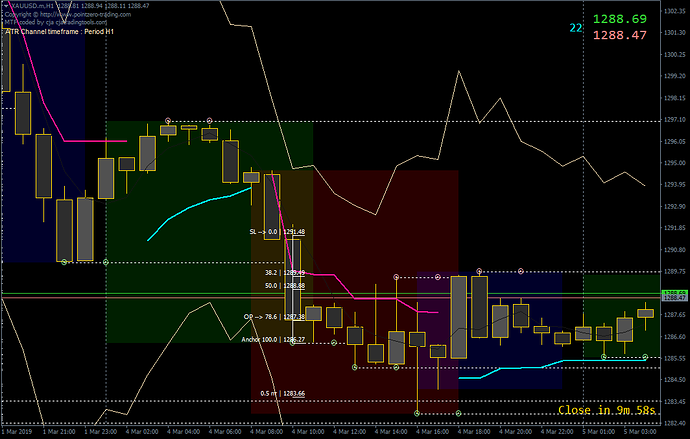 While Upper Chandelier were still intact, Price then moved to the South and touching TP on Candle 17:00. But closed below the Level on the next Candle. There, it indicated strong sign of further down move. So, if I was in the trade, as per Rulebook, I would trail stop by putting SL at TP, leave it to sleep, and wake up to close the trade just before American Session closed. 1. In such tight OP-SL Range, I am considering to widen the SL to the High/Low of where the 1st Upper/Lower Chandelier occurred. 2. For instance, this day’s OP happened in Candle 08:00. Meanwhile, Upper Chandelier started on Candle 05:00. Hence, the initial SL for this Trade supposed to be at the High + spread of Candle 05:00. 3. Looking at the Price Actions after OP, the Price never touched that level (spread considered). So, the candidate Policy makes sense and proven in this instance at least to be feasible. 4. Need more samples of course to test the hypothesis, and to put it as a Rule in the Rulebook. Happy with my TP Tactic. The setup was all good; so I took the trade. The Price Actions afterward were also smooth. The 3rd TBuC touched TP Level, but not closed above it; showed weak strength to push up further. I closed the Trade then and there. Price reversed strongly immediately after till end of day. My TC Tactic on how to do TP really saved my trade this day. Feeling grateful. After OP on Candle 09:00, Price move up steadily touching TP. Trade was closed soon after Candle 13:00’s close. Then, Price promptly moved downward strongly beyond SL until end of day. Proud of myself to stick with the Plan. This day’s Trade was an early-bloom Breakout. It happened an hour before my Signal Period started. 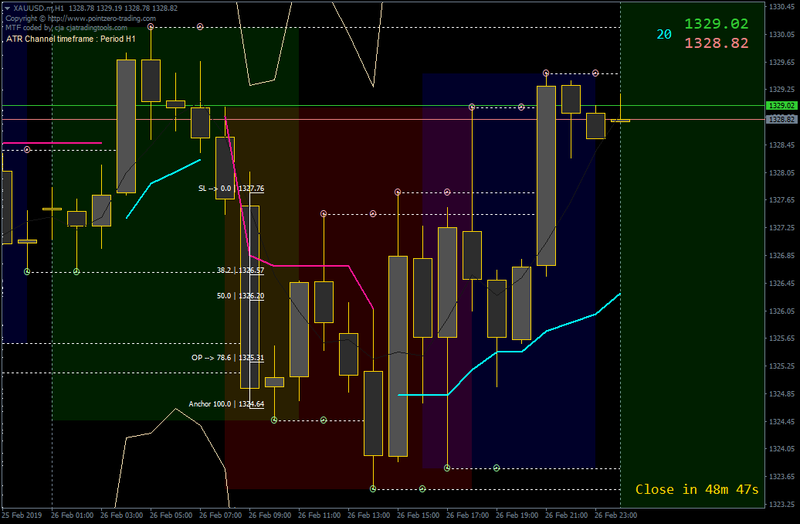 As per Rulebook, I opened the Trade on the start of the period on Candle 08.00. Price didn’t touched OP until hours later. Rulebook dictates to leave the untriggered order be until end of day. So I did. Hell of a ride emotionally, with a happy ending … eventually. Since it was an early-bloom setup, the SL was not on Candle 08:00’s Open + Spread but on Candle where the Breakout happened; Candle 07:00. TP Level also referred to this Candle’s ATR Lower Channel. 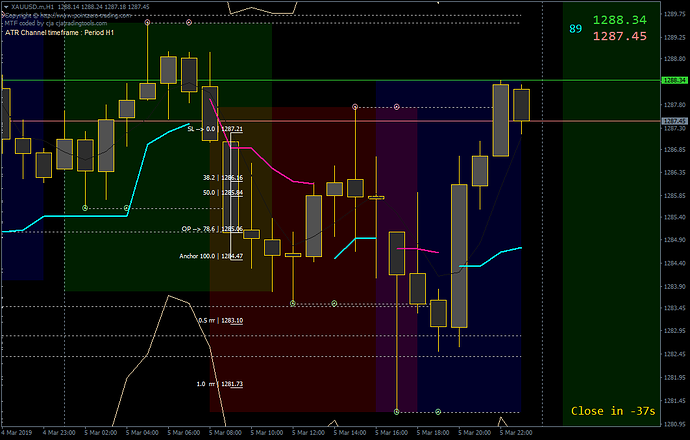 The OP almost got triggered on Candle 12:00 (spread considered), and finally did on Candle 17:00. Oddly enough, the TP was hit on that same Candle. The TP level was at the lower half of the Whole Candle with its upper Tail was longer than its Body. The candle forming was also in the context of pulling back from an Upper Fractal Level started since Candle 12:00. This indicated a strong South push was still to come. As per Rulebook, I trailed stop it by putting SL at TP, left it to sleep, and woke up to close the trade just before American Session closed with a stunning 5.5 rrr win. 1. PATIENCE is the most important virtue to hold on to while Trading. And it pays … quite handsomely. Not surprised and feeling grateful. This day, Price was at the strong support area. So, it’s no surprise that the valid Sell signal of my strategy lead to minimal success. In support area, Price tends to pullback up strongly. But, that didn’t happen. Hence, I’m still grateful for that little win. After Sell-signal Candle 10:00, Price touched OP then it practically went sideway. 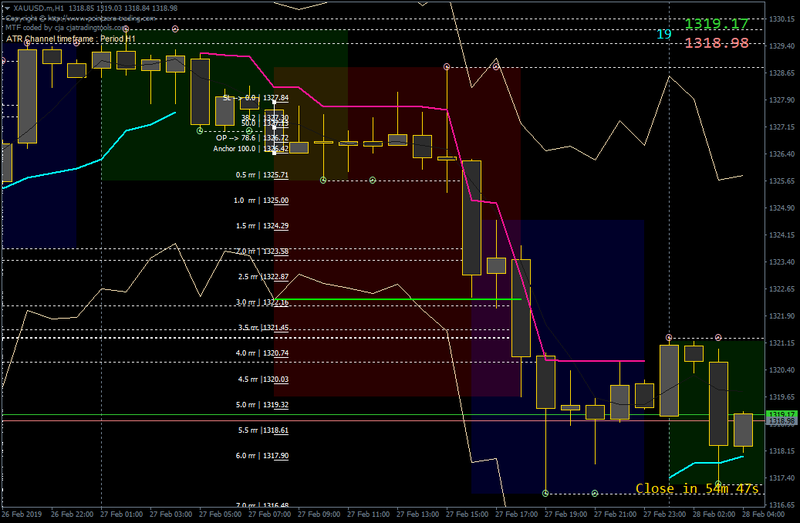 I closed the Trade few minutes before Price closed the day at near Anchor Level. In between, SL wasn’t licked. Hence, some small pips were obtained from this trade. 1. Reminding myself that the strategy’s success rate is measured by long-term success. Happens in all winning strategies. So, I’m not sweating this individual trade. More confidence with the criteria. This trade was similar with the Feb 26th one. Both trades had what I called Escalation pattern between the Breakout Candle and the previous 2 Candles before it. Such pattern is an exhaustive move. So joining the Trade at its last dying breaths would be a lost cause. And, lo and behold, I saved my equity from the volatile Market due to this screening as we can see in the chart. After OP on Candle 09:00, Buy Traders immediately showed resistance. It was strong enough that the designated SL was crossed at Candle 15:00. Six Hours later, Buyers fully dominated the market and pushed and closed the Price higher than the Day’s start level. On D1 timeframe, we can see Price is collecting momentum to go higher from support zone. 1. Reminding myself again that ‘To stay off the market’ is also a Trading Position. 2. Repetitive Price Patterns can happen in all timeframes. It’s our job to find and take advantages of them in order to improve the Success Probability of our trades. Getting used to it. Escalation pattern happened again this day, but with a few twists. Since a spade is still a spade, I decided not to open a trade because of this. And immediately after, the Price Action proved it was again probabilistically the right thing to do. Discussing the setup formation first, it was an early-bloom Breakout where Candle 07:00 closed above a Fractal Level created since Candle 22:00 of previous day. So, I needed to wait for the 8th Candle. Though turned Bullish and brokeout above 3 more Fractal Levels, this Candle moved up too fast, too soon. 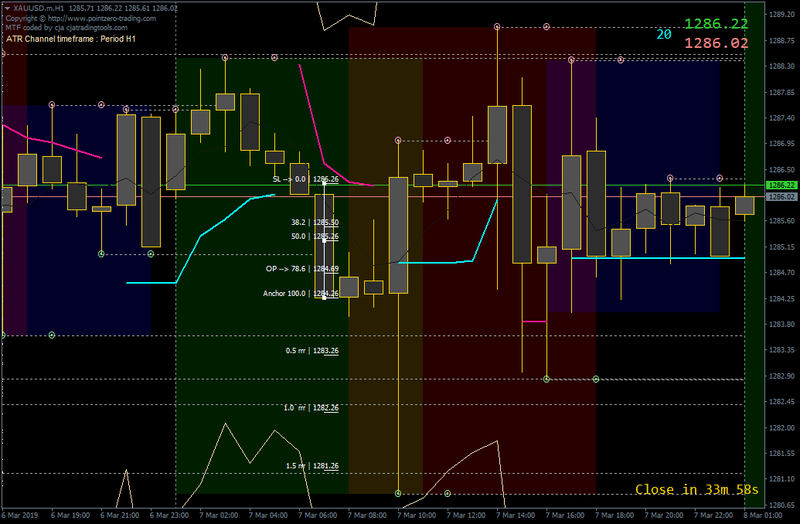 As a result, Candles 06:00 to 08:00 created an Escalation pattern again like in the previous day. On the next Candle, a sign of Pullback already appeared. The designated SL got crossed on the next candle after that. And finally, Price closed negative for the day. 1. I started to become a big believer to this Escalation pattern, at least for this pair. Well, what do you know?! If you have been following my posts this week, you know we have seen the Escalation pattern for 3 days in a row now. All three of them consistently followed up by a Pullback and then by choppy candle movements till end of day. I got this insidious idea of capitalizing the pattern into a trading setup, but decided not to. This is just a phase. Inspired by Bruce Lee’s wisdom, I need to master my current setups at least 10,000 times before even thinking to master another. Early-bloom Breakout happened on Candle 07:00 and so did the Escalation pattern which started since Candle 05:00. So, I wasn’t even bothered to open my computer then. But I got an email alert I set up previously that said a nearest Lower Fractal Level had been crossed on Candle 10:00. I said to myself, “Well I guess a pattern cannot be a hundred percent reliable.” Then, I got another alert that says my designated SL got hit too, by the same Candle! I was tempted to enter the market looking at such a strong Pullback, but too tired after I did a little project few hours before, so decided to let it go. It was the right thing to do as market just got very choppy since then, and even closed below this day’s opening price. 1. Market would entice you almost every time with its endless variations of tricks. It’s what I’ve been struggling with my strategy development since the beginning of my career. 2. As long as we stick with our guns and rely on the success probability of our strategies and risk management long-term wise, we’ll do great eventually. Fascinated. Various combinations of setups happened in every trade this week; I learned something new every day. This day we saw an early-bloom Breakout again on Candle 07:00 and an Escalation pattern too between Candle 05:00 to 07:00. Learning from previous days and following my Rulebook, I decided to stay on the bench again with this setup. Reviewing on the next day, I see Candle 08:00 made its own breakout. 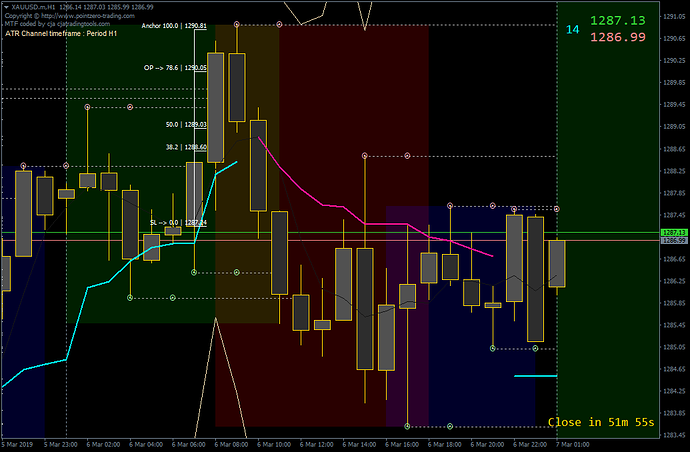 And from the Candle’s PoV, there was no Escalation pattern between Candle 06:00 to 08:00. So, if we see the Setup that way, Candle 08:00 was a potential Buy Signal. And combining it with the current Criteria, it ought to be a valid Buy Signal. And—in hindsight—we see Price did go up considerably after. Assuming I traded Candle 08:00’s Buy Signal, OP would definitely be triggered. But, no less than 5 hours later Price was still ranging before strong North Push happened in Candle 15:00. 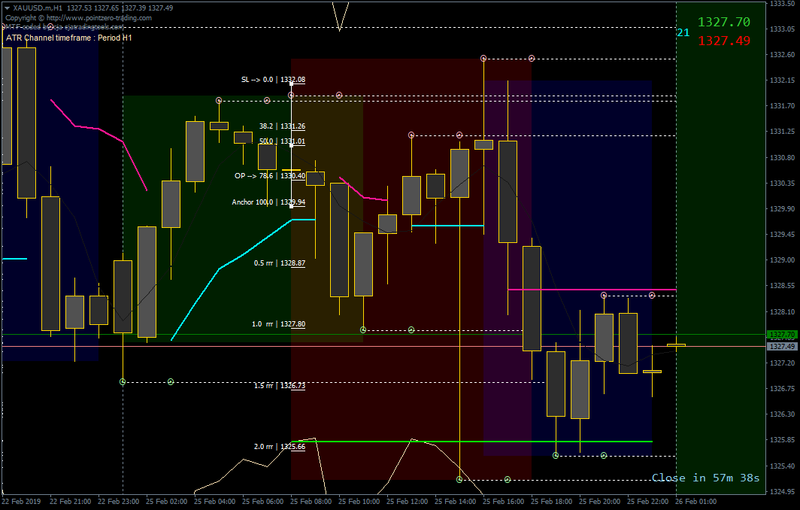 By end of this Candle which was also the 2nd TBuC, it closed above TP at its upper half. Rulebook dictated to stay on the Trade. Even after Candle 16:00 closed and appeared as a pullback Bearish Candle, the usual Trailing Stop still was to be maintained. Only after a new upper Fractal was confirmed on Candle 18:00, I then would close the Trade as per Rulebook at around 1.75 rrr. Later on, Price finally closed the day near the Level where Candle 18:00 closed. 1. Consecutive Setups seem to be independent from each other. This trade thought me that. When an early-bloom Setup is invalidated by one or more of its Criteria, it doesn’t mean the on-time Setup that succeeds it will also be automatically invalid. 2. Seeing the 1.75 rrr result, it also seems worth to trade in long term should the slight Choppiness of this Trade is also a typical Price Movement for this kind of Setups Combination. Would you set up a myfxbook or fxblue account so that it can track your trades here? Since you are posting them here it would make sense and be very useful for people that want to track your performance? Hi @BaconSandwich , thanks for the input. However, as I stated in the 1st post about things I won’t do, what you asked for is in that short list. With this thread, I only wish to record and improve my trading plan; a kind of a forward test. I’m not looking for validation in any way. I leave other utilizations of this thread to Viewers’ discretions. Hope you understand my PoV. Hi @Baldursufate , I thank you for your question as well. I use technical analysis only in this strategy. 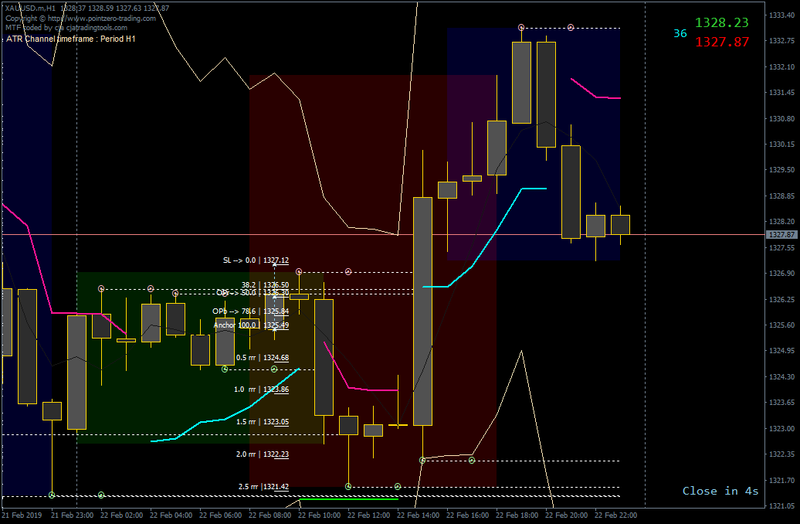 What I also notice is with this strategy I’m able to see the synchronicity between lower and higher timeframes. 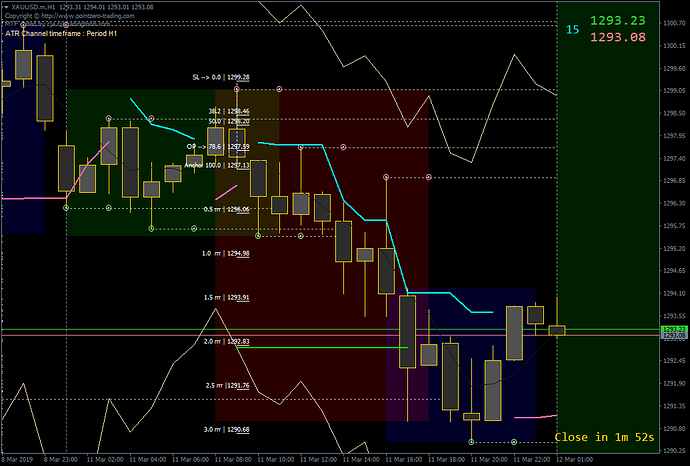 For example, between trade dates 05 to 07 March,we got invalid Sell Signals in our H1 Timeframe. If we look at H4 and D1 time, we see price was rejecting to go lower the existing support area, and building momentum to go up. If such synchronicity happens continuously, that means we only have to see whether our H1 Strategy gives valid or invalid signal, without the need to look at higher time frames. So far, it’s just a hypothesis though. Notice: Chandelier Colors have been switched. Hoping this is just a rare incidence. This day is the 1st day of the year when daylight saving time being replaced back to the normal hours. So, schedules will be 1-hour sooner again. Most of Price movements were anticipated including the late-triggered OP on Candle 12:00, until what happened at Candle 16:00. Price already below 1.0 rrr when Candle 14:00 closed. Typically, it would be safe to trail stop using the upper Chandelier. 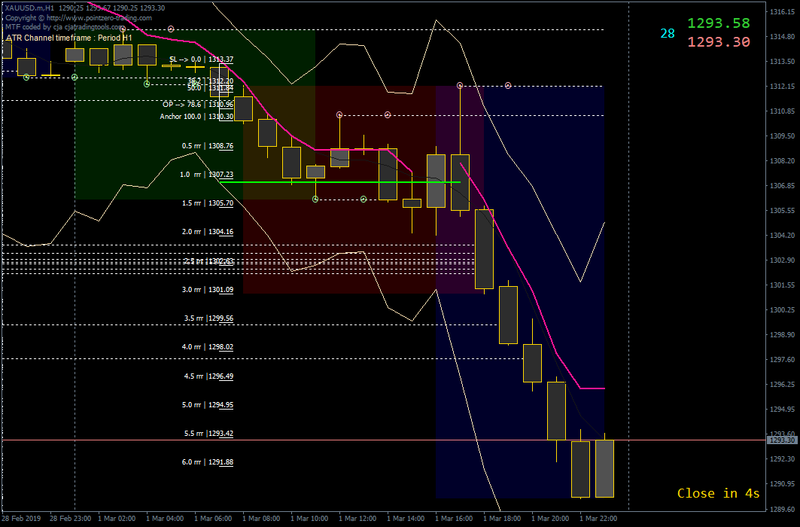 But on Candle 16:00, Price crossed my SL at Candle 15:00’s Chandelier level, before proceeding to go lower and hit TP. 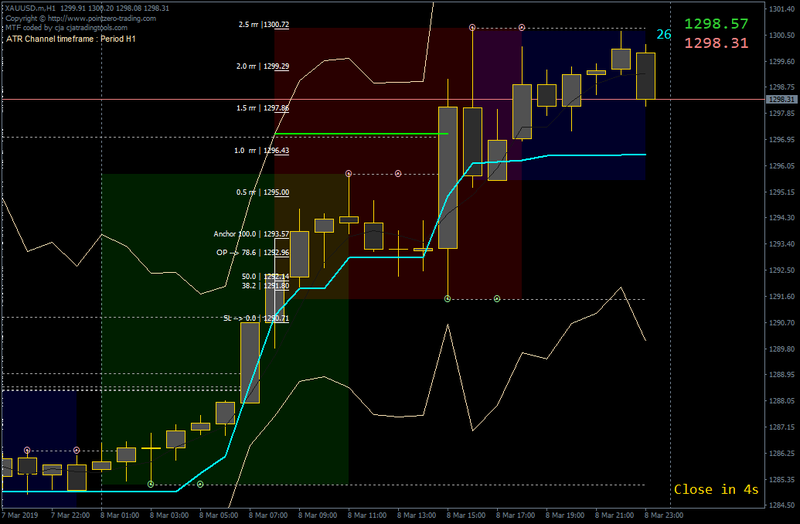 I recalled using rrr-based trailing-stop method that I created for my H4 Strategy. I’m considering to replace the Chandelier method to that rrr-based one should the frequency of such price dynamics become too frequent in near future. 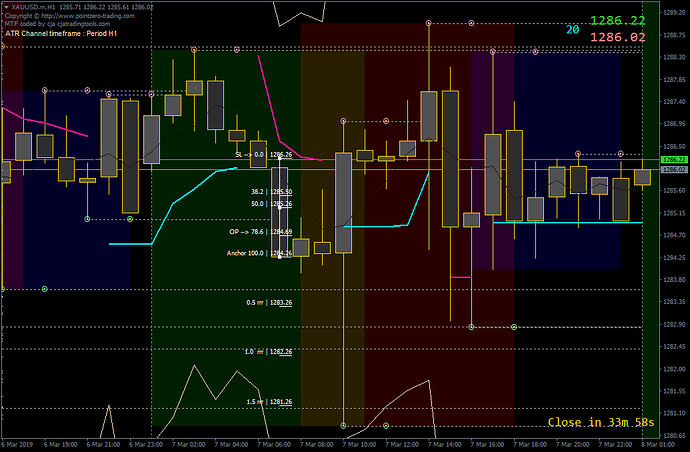 The on-time Reversal Setup on Candle 08:00 and 09:00 was not typical, but still within the predetermined definition in Rulebook. Late trigger of OP happened 3 Candles later. Candle 14:00 closed below 1.0 rrr, so, it was time to use Chandelier trailing stop. Unfortunately, Price hit it on Candle 16:00 before it goes further down to hit TP. So, my win was no more than 0.6 rrr in this Trade. As I recall, in the history of my back and forward tests of the strategy, this is the first time Price hit Trailing Stop first. Moving on, assuming I was still on the Trade, though TP was within upper half part of the Candle, the Candle itself formed a rejection price action against a Fractal Level; the Candle’s Lower Tail is much longer than its upper one. Hence, I then would close the Trade at its Close. 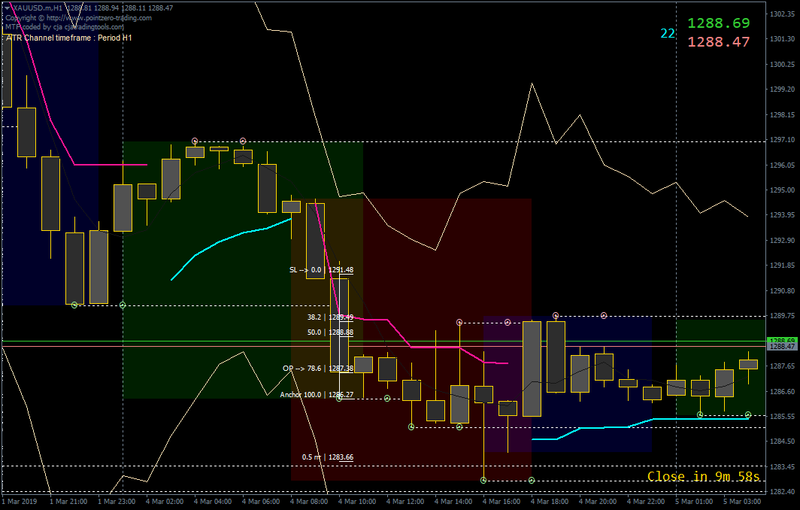 Price later tested the Fractal Level again before bouncing and closed the day above TP. 1. May be I’m just shocked seeing for first time the Trailing Stop got hit first. Hopefully, this will be a rare occasion. But if not, I still have the rrr-based method as a backup.